Ugueto, profiled in the latest SciArts video, explains the challenges and wonders of his craft and breaks the stereotypes of how dinosaurs are depicted in popular media with guest host Flora Lichtman. View an animated breakdown of some of the important steps in Ugueto’s illustration process below. Plus, see a gallery of more of his reinterpretations here. Gabriel Ugueto is a paleoartist and science illustrator based in Miami, Florida. FLORA LICHTMAN: Now, close your eyes and picture a dinosaur, any dinosaur. Do you have one in mind? Now, think about where that mental image came from. Maybe it was a drawing you saw online; or a children’s book; or a museum exhibit; or if you were alive before 1993, perhaps it was a certain blockbuster film about dinosaurs. Every one of those dinosaur images though had to be created from clues that dinosaurs left behind, like bones; and footprints; and fossils; and yes, feathers. And this means that we owe our understanding of dinosaurs just as much to artists as we do to scientists because it’s the artists who take scientific evidence and turn it into a picture. And those pictures of what dinosaurs looked like have changed dramatically in the last 20 years, which means that your vision of a dinosaur might need a refresh. Here to tell us more is Gabriel Ugueto. He’s a paleoartist and science illustrator, who lives in Miami, Florida. He’s also the subject of our latest SciArts video. If want to visualize the animals that he is talking about, go to our web page, sciencefriday.com/dinoart. Welcome, Gabriel. FLORA LICHTMAN: And we welcome your questions about dinosaurs as well. Do you have a myth– a dinosaur visual mythbuster that you want busted? Give us a call. Our number is 844-724-8255. That’s 844-SCI-TALK. Or tweet us @scifri. OK, Gabriel, I want to start with I think the classic dinosaur image, which is the Jurassic Park T. rex. GABRIEL UGUETO: Well, back when the original film came out, not much was wrong with it. But today, I mean with what we know, um, you can say a few things. That, for example, T. rex probably had prominent lips. And when I mean lips, like most of the teeth would have been covered. It probably also has some sort of feather covering on top of its body. GABRIEL UGUETO: Probably, like on the dorsal part of the neck and probably on the dorsal part of the body, especially on the trunk. FLORA LICHTMAN: I’m thinking about long mohawk. GABRIEL UGUETO: Probably. I mean we don’t know. And there is no direct evidence for it. But relatives of Tyrannosaurus, early relatives of Tyrannosaurus, have been found to be completely covered in feathers, from head to toe. GABRIEL UGUETO: So Tyrannosaurus was a bigger animal. And it probably lived in a warmer climate. So it probably needed less covering. But it most likely still probably had some sort of covering. I mean think about elephants, for example. They look naked. But in reality, they have small hair, like a little bit of fuzz on top of their body. FLORA LICHTMAN: Yes. What are the other popular misconceptions about dinosaurs that stem from the way they’re drawn or the way we see them in movies? FLORA LICHTMAN: Well, how small was it? GABRIEL UGUETO: Well, about the size of a turkey. GABRIEL UGUETO: However there was a raptor species called Utahraptor, which was about the size of the one in the movie. But the problem is that one would also be covered completely in feathers. And it would probably look more like a giant turkey. FLORA LICHTMAN: A very threatening turkey. GABRIEL UGUETO: A very threatening turkey, with very big claws and teeth. FLORA LICHTMAN: You also, I hear, have a beef with dinosaur skinniness. GABRIEL UGUETO: Yes. Well, I think for a long time paleoarts suffer from shrink-wrapping everything, skin wrapping everything. Like, you know, there was no room for muscles or fat tissue. And if you look at animals alive today, you see how much– most of the skeletal structure is hidden by the muscles, and skin, and fat. So you don’t see much of the actual shape of the bone. So right now we’re in the middle of, like, a revolution in paleoart because a lot of artists, like myself, are depicting dinosaurs with what I consider is a lot more natural– a more natural look, like including room for fatty tissue, muscle, and probably thinking of different types of integument, like feathers or scales in different part of their body. FLORA LICHTMAN: Well, speaking of feathers, why do people object to the feathers? FLORA LICHTMAN: Why don’t you like the term raptor? GABRIEL UGUETO: Well, because raptor is used in biology to refer to birds of prey originally. The movie called Dromaeosaurs, which is what raptors– they called them raptors in the movie. But that’s not the actual name. The actual name should be Dromaeosaurs. FLORA LICHTMAN: Hm. I want to go to the phones. Let’s go to Tim in Oklahoma City. Hi, Tim. TIM: How are you guys doing? FLORA LICHTMAN: Great. What’s your question? TIM: My question was what kind of, if any, modern living animals do you take measurements from to reconstruct the look of dinosaurs? I’m thinking along the lines of, like, John Gurche does, measuring modern humans and chimpanzees to help reconstruct tissue mass for early hominids? GABRIEL UGUETO: Yes. I think that’s very important. I think, looking at today’s dinosaurs, which is modern birds, and their relatives, like crocodiles, it’s very, very important to understand how their muscles and how the other integument will be in dinosaurs. I spend a lot of times in the zoo, looking at birds and crocodiles and to understand how they look and how they look at life themselves, to understand how they behave. Because more than likely, dinosaurs would have behaved in a similar way. FLORA LICHTMAN: I’m Flora Lichtman. And this is Science Friday, from PRI, Public Radio International. Gabriel, how do you decide what colors to use? GABRIEL UGUETO: Well, I take into consideration several things. First of all, nowadays, there’s a lot of superamazing discoveries in many fossils that have preserved impressions of feathers or scales. Paleontologists have discovered that melanosomes, which is a structure that is responsible for color in animals, fossilize. 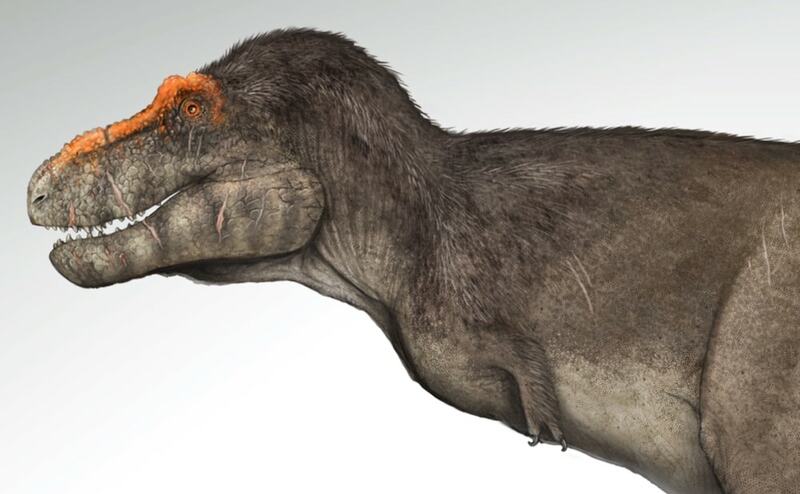 So we can now tell more or less the coloration of some dinosaur species. Like, for example, the archaeopteryx is known to have been primarily black. So if we have skin impressions, which is very rare, we can probably say a little bit about the coloration, the actual coloration. Otherwise, I look a lot at what the climate was where the animal lived, what type of habitat it lived in, and what are the suggested habits that the animal had, to make an educated guess of what it could have been colored. FLORA LICHTMAN: Do dinosaur feathers look the same as bird feathers? GABRIEL UGUETO: Some. I mean dinosaurs had a wide range of feathers, of feather types. There were some that looked more like hair. They were monfilamentous. And there were others that were pennaceous, like today’s birds. For example, to give you an example, velociraptor, or some other dromaeosaurids, had something that looked more like fuzz on their bodies. But their wings, their hands, had pennaceous feathers, like today’s birds. FLORA LICHTMAN: Let’s go to the phones. Let’s go to Robin in Orlando, Florida. Hi, Robin. ROBIN: Hi. How are you today? ROBIN: So I am a sixth grade teacher. And I have a student who loves dinosaurs and loves drawing birds. And he’s actually really, really good at it. And I was wondering what resources I could point him to, to maybe look into a career in paleoart? GABRIEL UGUETO: Well, I think the most important part is the art part of the career. I mean you have to study illustration or graphic design, something that points you in that direction. Also, there are careers specialized in scientific illustration. And I would say one of the most important things, to be familiar with your subject. So you have to read a lot of scientific papers and get really involved in that community. Read a lot. A lot of the process for me to create an animal, I have to research a lot and read a lot of scientific papers. So it helps a lot to know a lot about the subject. FLORA LICHTMAN: Thank you, Robin. Gabriel, have you always been a dinosaur geek? Since I remember. I mean, since I was a kid. And I grew up with the new movies. And I was always interested in animals, but in particular dinosaurs. And that took me to my other love, which are reptiles. FLORA LICHTMAN: What do you love about them? GABRIEL UGUETO: They’re just amazing animals. I think they’re so– well, first of all, they look amazing. There’s nothing that look like them today. And they are so impressive, their size, and the way they behave, and how they dominated life on Earth for so long. They were so well adapted to the environment. FLORA LICHTMAN: This might be like naming your favorite children. But do you have a favorite dinosaur? GABRIEL UGUETO: No. It’s very difficult. And it is like naming your favorite children. I guess– I don’t know. I think I’m a little bit partial to theropods, which is this group of dinosaurs that are carnivorous, like includes, like, tyrannosaurs and velociraptor. But honestly, it’s very difficult. I mean, I love them all. FLORA LICHTMAN: In the 10 seconds we have left, can you tell me what to look for when I look at a drawing of a dinosaur so that I know it’s a good one, like that it’s lifelike and good? GABRIEL UGUETO: A big telltale sign is if you can see the skull shape, the exact skull shape in the drawing of an animal that should be alive, then it’s not a good drawing because you’re seeing something that just put it like– it’s not a good drawing. FLORA LICHTMAN: That’s a perfect place to leave it. Thank you, Gabriel. GABRIEL UGUETO: All right. Thank you. Thank you for having me. FLORA LICHTMAN: Gabriel Ugueto is paleoartist and science illustrator in Miami, Florida. And you can see our latest SciArts video of Gabriel’s work on our website, sciencefriday.com/dinoart, courtesy of our video producer, Luke Groskin.